Want to be the hit at your next party? This one is easy… make this easy recipe for George Foreman Grill sliders! 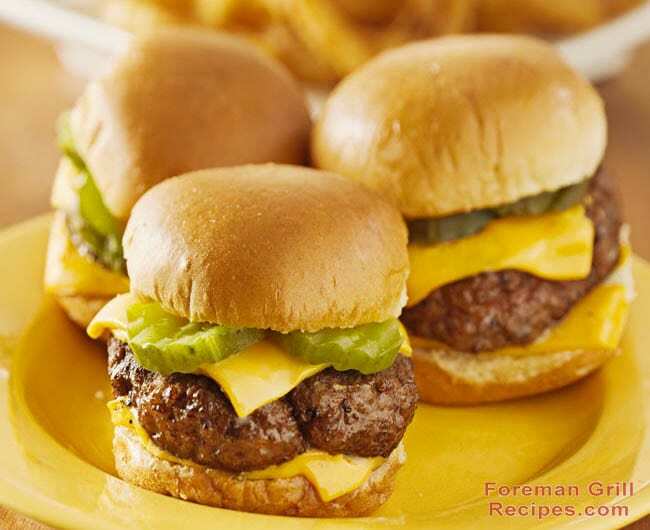 Sliders are small, snack sized hamburgers which can be easily made with your Foreman Grill. Your kids are gonna absolutely love these and want to help you make them. Your party guests are gonna clean the plate off in no time. Make these as appetizers. Make these as a meal. The possibilities are endless. Every grocery store has fresh dinner rolls which are either already made and pre-packaged, or the ones which quick bake right in your own oven. You really can’t go wrong with either ones. Hawaiian rolls also make outstanding buns for the sliders. And the pickles… oh the pickles! Make sure to have a fresh jar of pickle slices to top off these little delights! In a large bowl, combine ground beef, onion soup mix and bread crumbs. Mix well until all ingredients are well combined. Shape into balls approximately 1 1/4 inch in diameter. Preheat your George Foreman Grill for at least 5 minutes with the lid closed. Use high setting if you have it. Flatten meat balls into small patties and place on grill. Close lid and let grill for 1-2 minutes. Check for doneness. Sliders will grill quickly. Add cheese slices in the last 30 seconds and keep the lid open. Let the cheese melt nicely on the sliders. Serve on sliced dinner rolls with mustard, ketchup and of course – a couple of pickle slices. Oh you’re gonna love these!